Flashback: Dust Storm of the Century! While I’m traveling and away from my computer, I’m re-running some favorite older posts from this blog. This one was originally posted last June. Enjoy. When I started this blog I knew that if I ever ran short of ideas for posts, I had plenty of material saved up from my time in Canada, Costa Rica, Australia, etc. Well, that time has come. I’m not so much running short of ideas as I am of time and energy to go out into the woods for inspiration; temperatures this week have climbed into the nineties, which, when combined with the godawful humidity of Ohio summer, feels like living at the bottom of a warm, sticky lake. Add to that a demanding job, and it’s just been a while since I’ve hit the trails by myself with my camera. It’s on my to-do list for this weekend. So. Let me tell you a story. 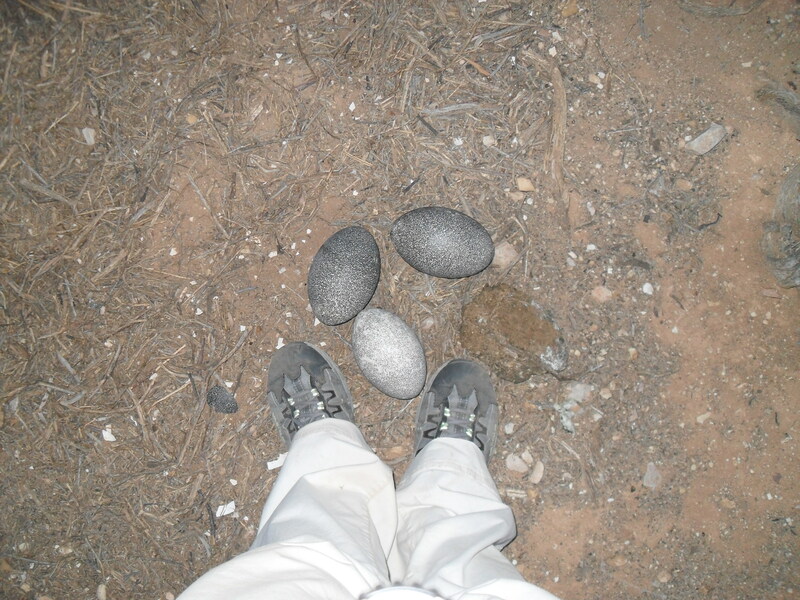 Because it was a desert ecosystem – one that made southern Arizona look almost lush in comparison – it was fairly common on windy days for a certain amount of dust to be whipped up into the air. The first time I saw the horizon go brown with dust I was deeply impressed. A real live dust storm! How exotic! One afternoon it started to get dusty, and then it just kept getting dustier. 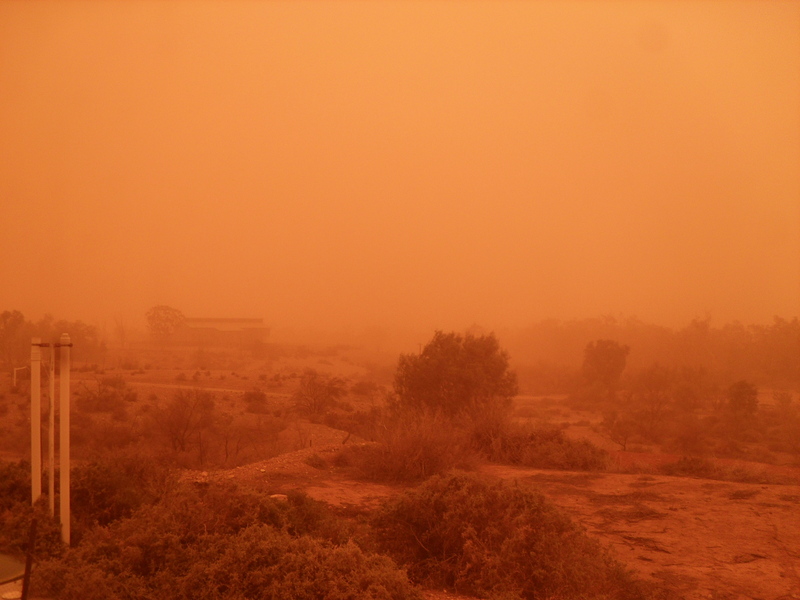 I somehow missed getting any photos or video of the absolute blackest part of the storm, but a quick YouTube search for “dust storm in Broken Hill” (Broken Hill being the nearest town) yields endless clips taken around 3:30PM by bamboozled locals. Yes, that’s right, this video of what appear to be car headlights in the middle of the night was taken at three-thirty in the afternoon. We put cloths along the bases of all the doors to the outside to keep the dust out of the house, but with limited success; during the worst part of the storm the air was pretty thick with it even inside, and it was just lucky that none of us had respiratory problems. It was fun to clean up, too. 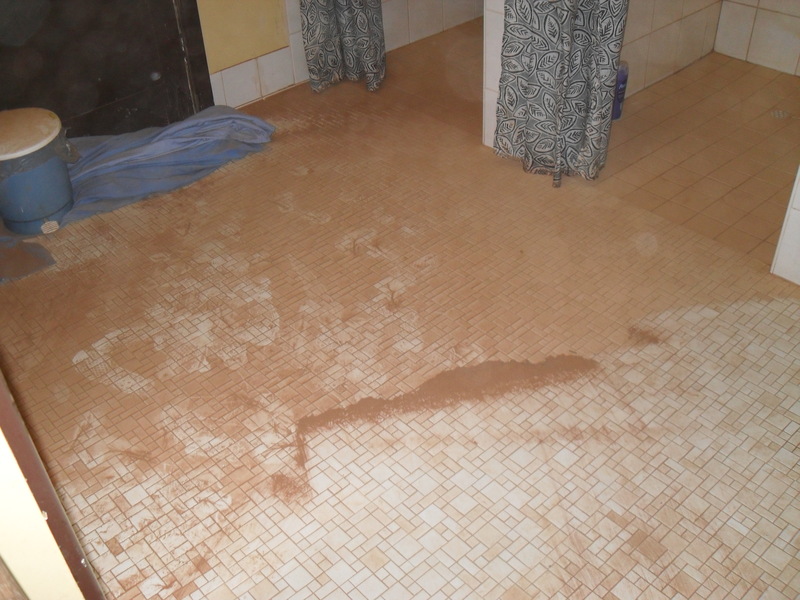 Here is our partially swept bathroom floor the next day (our bathroom had an outside door for some reason). This dust storm went on to hit Sydney, which according to my parents actually merited a small mention in the news in America, and even made it all the way across the sea to New Zealand. 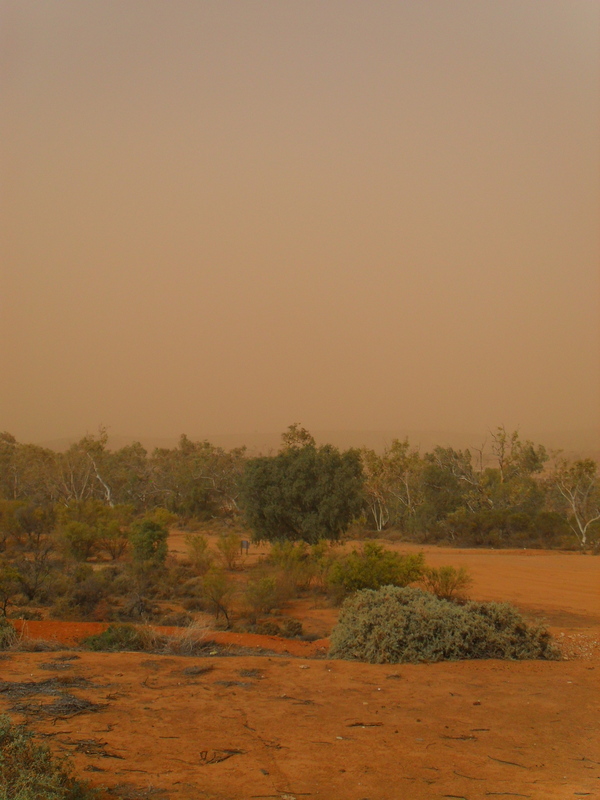 People told me afterward that it was the worst dust storm Australia had seen in seventy-some years. It has its own Wikipedia article. All I know is it was like the apocalypse, or being suddenly transported to Mars, or something. Never let it be said that I don’t have an interesting life. Whoa! Holy smokes! Okay, maybe the humidity of Ohio doesn’t seem so bad compared to this, huh?